Very simply, if we are not careful, all of our healing justice work is going to become just another piece of the machine. If we are not careful, the culturally-grounded, beautiful and deeply loving spaces that we are creating, private spaces with handmade artwork on the walls, will become a node on the organized profit machine that is the medical industrial complex. The illustration above is a map that Mia Mingus, Patty Berne, Cara Page and a number of other disability and healing justice thinkers put together after a multipart conversation. Mia explains it beautifully and offers more explanation as a tool in our work for collective liberation. When I was in my late 20s, after having dropped out of college for about 10 years, I decided I wanted to finish my degree. I had also been living away from the US and so, upon coming back, decided to enroll at Antioch College in Yellow Springs, Ohio. I liked that Antioch was focused on experiential learning. As students we were less in the classroom and more in the world, doing internships and learning by just being in life. A more radical and glorious bunch of people you couldn't find. It was there, amidst the corn fields and old wooden farm houses, that I started to wonder if I had been duped. After all, it was perfect. We had a contained bubble of hundreds of incredibly radical folks, mostly young and very very able-bodied. Everyone slept with each other. Fought with each other. Introduced each other to friends living in other contained bubbles in other towns and cities. And we grew perfect and strong. And I remembered how the immune system has evolved to operate: when there is a danger to the body that would take a lot of energy to destroy or expel, it contains it within a membrane, something that mimics being connected to all life but is, instead, off doing its own thing and not negatively impacting the body as a whole. I sat there in Yellow Springs and felt the containment, even as we were all talking about revolution. How very non-threatening we all were. I think about this when I think about my work at the People's Movement Center in Minneapolis. I am so grateful for our work. I believe it is important. 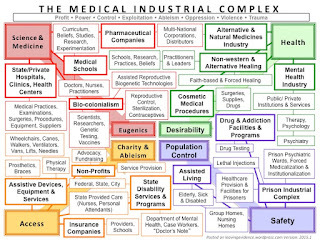 But I also believe that, if we aren't careful, we are going to become that node on the top right of the Medical Industrial Complex map; a contained little membrane where those who have access, like a secret code, can come through our doors and be there, in the closed off membrane along with the rest of us. I am inspired by the possibilities that can be grown out of the rich fertile ground where disability justice and healing justice meet and overlap. I ache for more healers that don’t continue to perpetuate ableist notions of how bodies should be (or strive to be) and for disabled folks who don’t have to only know “healing” as a violent word because of our histories of forced healing, cures and fixing. I get excited about practitioners who have accessible spaces and practices that can hold all kinds of bodies and minds; and collective access and care that allows more and more disabled people to be less and less bound to the state. I assume there are healers and other practitioners reading this blog. If so, I link arms with you and say, here is our struggle. We have a large public, a medical industrial complex, which is how most people, particularly those who are poor and Black and Brown, get their care. 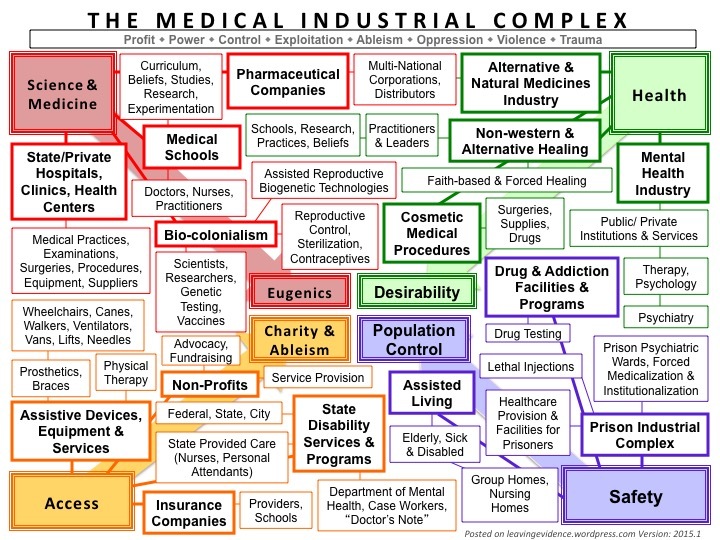 This is a system designed to manage people, to weed out the "abnormal" from the "normal," a process of eugenics I wrote about in an earlier blog post. There are also significant powerful people working in this system who are trying to make change, to remain relational, to shift healthcare as control into something that recognizes our complex humanity. I want to be in community with those people and with you to learn how to do all of this: to do the kind of transformative liberated work that is not possible within the bounds of most parts of the medical system and, at the same time, to refuse to let ourselves be privatized. Not a single one of us can heal until all are healed.